In my younger years, I found comfort in getting my hair combed. It was a ritual in our home. Every Sunday night, my sister and I knew what we had in store. After the house was scrubbed of all the mess that five children brought about, and the laundry was folded and the dinner was cooked early and devoured within minutes, our hair was to be done for the week. On Sundays, I looked forward to the comb. It meant I would spend hours one on one with my mother, wrapped in-between the comfort of her legs sitting on a pillow, laughing, talking, and anxiously waiting to see what braiding technique she decided to bestow upon my head for the week. My sister was different. All of my earliest memories of my sister and Sunday’s ritual, were a bit traumatic. She was tender headed, and did everything in her power to run away from the comb. I’m sure she would have grown to love whatever nest that weaved in her beautiful head of hair at the time. She avoided it like the plague. Even when my mom used the most gentle hand, and sped through in an astonishing fashion, my sister fought it. Her fear became a running joke in the family. And now, looking back, I want to bow at the feet of my mother for doing all she did in a day’s work. For making me feel like magic and for trying Sunday after Sunday on my sweet sister. True will power. 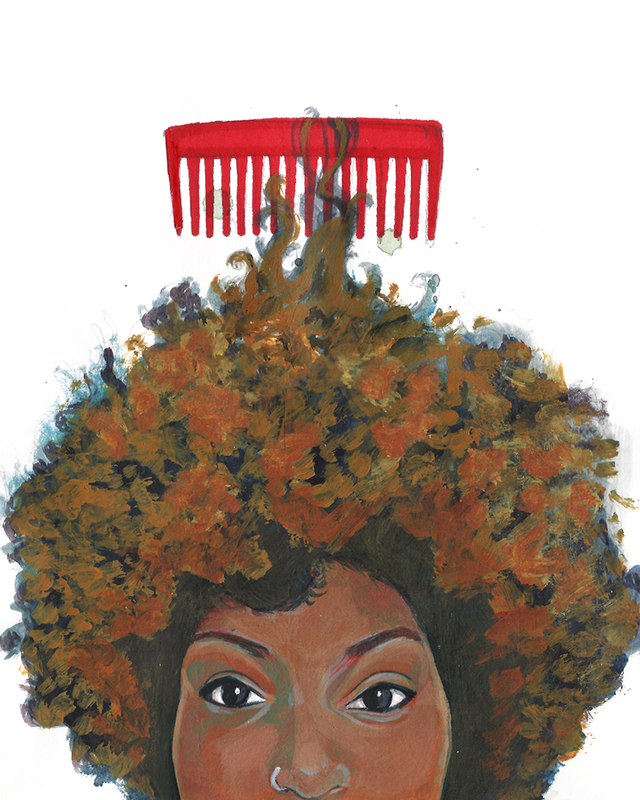 This post isn’t so much about past rituals, as it is about combing, or choosing not to comb your natural hair. Now that my hair is natural, the times I do comb my hair are of a rare occasion. I often compare the reasoning to that of having dreadlocks. One of the main issues with having permed hair, is the need to comb it through all too often. From it being wrapped to unwrapped, to the fly aways, washing and perming. A lot of seemingly innocent perm rituals require something so small, yet, so big… combing. Combing, should always be the last resort to untangle hair, and should never be done with any old comb. Sounds difficult? See, when you have natural hair, after a while you’ll notice that your hair manages much better when tangles are managed with a specialized comb (more on that below), or your hands. Your hair gets acustomed to the motions and environment. If done correctly, natural hair needs no extra pulling and tugging. If you need reference, lets take locs for instance. If someone chooses to loc their hair, their hair grows incredibly fast. Faster than someone with natural hair, and much faster than someone with permed hair. Dreads require little upkeep, and avoid the comb in it’s entirety. Doing this, allows the hair to just stay and grow, rather than end up on the bathroom floor. When you have natural hair and avoid the comb, the dead hair finds it’s way out on it’s own. Shedding And the new growth, is kept put and strong. Leaving your hair to it’s own devices to grow powerful and fast. -Your hands– The most powerful tools we have in this combing natural hair game are our hands. Rub a little oil on them, and gently detangle your hair with your fingers. –Denman Brush– Other than my hands, and besides the occasional wide tooth combs for parting (I also recommend using your hands. ), I use this brush. It’s a cross between a wig brush and comb. It’s super gentle, yet study. It’s great to use in the shower as well. – A pick- It isn’t necessarily for combing. But I love having my hair look full, even when I just remove my two-strand twist. This one is infused with Argan Oil. P.S- I use this set for my curly headed kiddos. 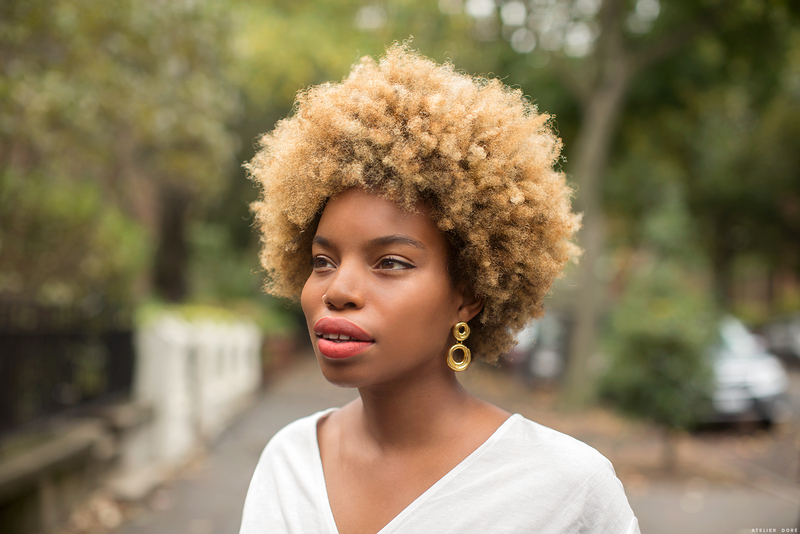 Other natural hair tips and tricks, here, here, here, and here. Art by Emily De Nicolais for LaTonya Yvette. Thanks for the tips. I rarely comb my natural hair because I am also tender headed. I will be purchasing that brush. Love your blog. This was incredibly useful. Thank you for sharing. Please let me know what is the size of your PUBLIC bike and how does it go week with your height? I have a PUBLIC Bike C7 in M/L and I am "5'7". However, I feel the bike is so large for my body. I am wondering if perhaps a S/M would have been better? Hi Paola! I'm a little under t 5'5 and I chose to get the small. The 5'7 went up to like 6'2 I think? So I knew it was going to be way too big. A tip to make sure your bike fits, is that you should be able to balance your self on your bike, with your left and right tippy toes hitting the ground. If they don't hit, then the bike is too big. Thank you! Also, make sure you always use the brush with conditioner in the shower. Never use while your hair is dry.